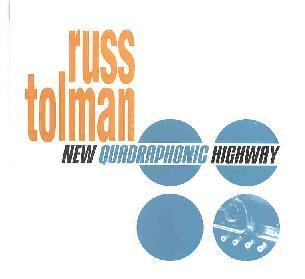 Russ Tolman - "New Quadraphonic Highway"
First of all, let me say to all the purists in experimental music land that I think the banjo is a cool instrument. And I dig a good song. The focus here is on the SONGS. Stylistically we've got blues, country, good time head boppin' rock. Good lyrics. A bit of Grateful Dead, The Byrds, The Allman Brothers, Hot Tuna, The Kinks, John Mellancamp, it's all over the place. But Aural Innovations buddy Doug Pearson is also present with his WIARD analog synth embellishing most of the songs with a strange but cool freaky factor that adds a bit of the oddball to these very well done, if somewhat mainstream, songs. I mean, how can you not love banjo and pedal steel accompanied by zany synth noodlings? My favorite track on the disc is "How To Do Everything Right". This is space rock of a different breed indeed. It's a bluesy country type song-oriented rocker, but with prominent freaky whooshing and bleeping synths. It's an oddball contrast but this is such a solid song that I've gotta love it. Like a cross between The Kinks and The Byrds shot into the cosmos. Other standout tracks include "That's Not The Way". This is the opening track and I'm thinking John Mellancamp, maybe even the Grateful Dead. But I'm also hearing all these freaky synths doing dips and dives throughout the song. "Quadraphonic Highway" is a lazy country song with bwaaaaaaah pedal steel and all. But there's all these chirping bird synths. It's a freaky contrast. A bit humorous, intentional or not. "I've Had A Few" is another tune that grabbed with synths that are more subtle, just adding little embellishing bits. And "Tolman Comes Alive" strikes me as a country blues version of The Turtles "It Ain't Me Babe". Yeah, really. It's so catchy I was singing along on the first listen. In summary, well... this is a strange album. On the surface it's not for AI readers. But if you don't fear a good song and find value in country and blues then you'll find some interesting music here, especially given the inclusion of the space synths. You can visit Russ Tolman at his web site. New Quadraphonic Highway is distributed by WEED Records. You can visit their web site.